The profitability of a rectifier should not be restricted solely to its efficiency. Nevertheless, the PSP Tower too provides an optimum energy efficiency, like all the devices of MUNK GmbH. High availability, reliability and low maintenance costs are further profitability-enhancing criteria that are reflected by the design of the PSP Tower. The PSP Tower is for sure the right choice for you: Owing to its modular design, you can adjust the capacity individually to your requirements. Each 1,500 A module has its own stackable enclosure. This is a huge advantage as you just need to put another module on top of the existing PSP Tower, and in next to no time you will have assembled a new rectifier with a higher output power. More Process Stability, Lower Maintenance Costs, More Operating Hours! These are the advantages of the PSP Tower because of its small number of modules. 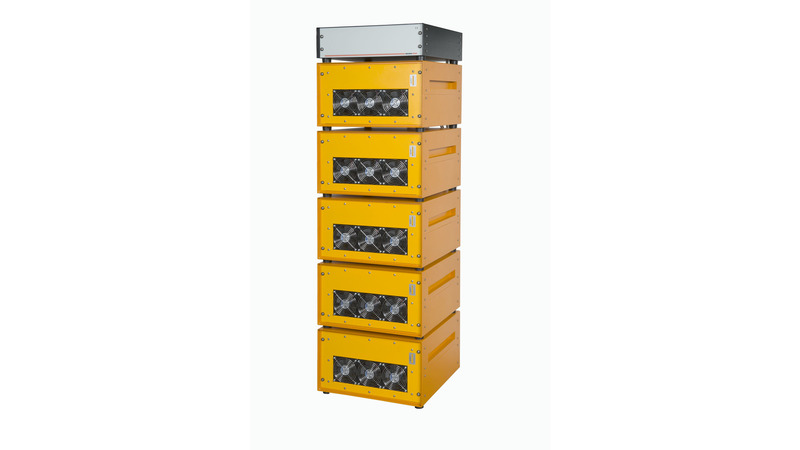 Due to a module capacity that is three times higher than the capacity of other concepts, the PSP Tower is the most powerful tower device in its class. All connections of the power modules are easily and quickly accessible from the outside. The PSP Tower is the chameleon among the rectifiers as you can always adjust it very quickly to any of your requirements. This way, you already profit from a sustainable investment as soon as you purchase the PSP Tower.